Metabolic bone disease is a common complication of chronic kidney disease (CKD) and is part of a broad spectrum of disorders of mineral metabolism that occur in this clinical setting and result in both skeletal and extraskeletal consequences. Detailed research in that past 4 decades has uncovered many of the mechanisms that are involved in the initiation and maintenance of the disturbances of bone and mineral metabolism and has been translated successfully from “bench to bedside” so that efficient therapeutic strategies now are available to control the complications of disturbed mineral metabolism. Recent emphasis is on the need to begin therapy early in the course of CKD. Central to the assessment of disturbances in bone and mineral metabolism is the ability to make an accurate assessment of the bone disease by noninvasive means. This remains somewhat problematic, and although measurements of parathyroid hormone are essential, recently recognized difficulties with these assays make it difficult to provide precise clinical practice guidelines for the various stages of CKD at the present time. Further research and progress in this area continue to evaluate the appropriate interventions to integrate therapies for both the skeletal and extraskeletal consequences with a view toward improving patient outcomes. Metabolic bone disease is a common complication of chronic kidney disease (CKD) and is part of a broad spectrum of disorders of mineral metabolism that occur in this clinical setting. 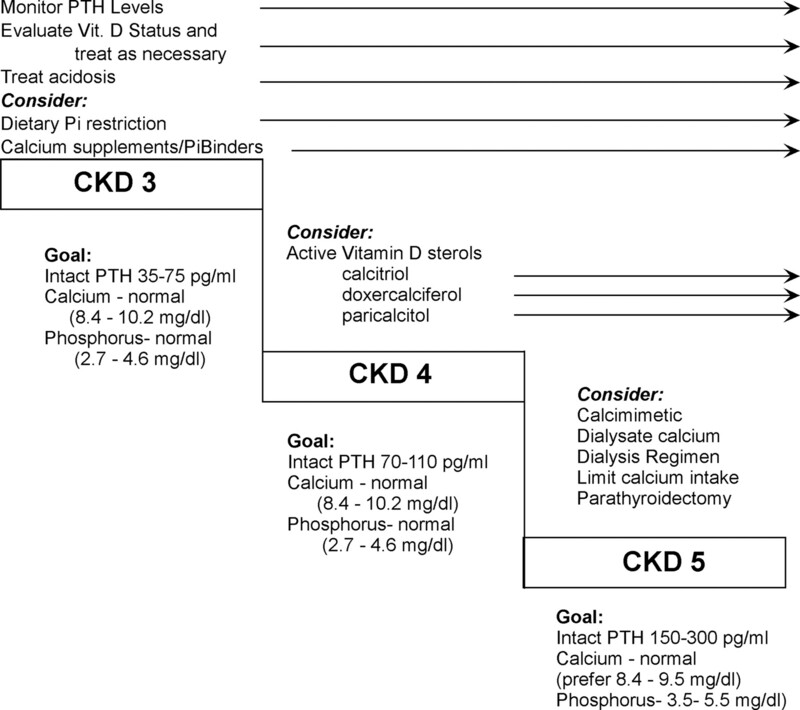 Alterations in the control mechanisms for calcium and phosphorus homeostasis occur early in the course of CKD and progress as kidney function decreases; if left untreated, then alterations can result in significant consequences. The disorders of bone have to be considered not only with regard to the bone itself but also with regard to the consequences of disturbed mineral metabolism at extraskeletal sites, including the vasculature. In recognition of the broad spectrum of disorders of mineral metabolism in this clinical setting, it has been recommended that terms such as “renal osteodystrophy” and “renal bone disease” give way to the term “CKD-mineral and bone disorder” to describe this broad clinical syndrome that develops as a systemic disorder of mineral and bone metabolism as a result of CKD that can be manifested by any one or a combination of the following: (1) Abnormalities of calcium, phosphorus, parathyroid hormone (PTH), and vitamin D metabolism; (2) abnormalities of bone turnover, mineralization, volume, linear growth, and strength; and (3) vascular or soft tissue calcification (1). The abnormalities in bone in the setting of CKD include the effects of high levels of PTH on bone, which results in the high-turnover bone disease osteitis fibrosa. In addition, in the setting of CKD, a different skeletal abnormality known as adynamic bone, which is characterized by an extremely low bone turnover, may occur. Some cases may demonstrate mineralization defects and show frank osteomalacia. This wide spectrum of skeletal abnormality can give rise to a variety of mixed patterns, with elements of the effects of hyperparathyroidism on bone together with mineralization defects, and is known as mixed renal osteodystrophy. In addition, other systemic processes that may affect the skeleton, such as the accumulation of β-2 microglobulin or the systemic effects of postmenopausal osteoporosis or steroid-induced osteoporosis, may complicate the picture. A wide variety of disturbances of bone metabolism may occur in the setting of CKD. An understanding of the pathogenesis of these abnormalities then becomes essential to design a rational approach to their treatment and to the prevention of complications. High-turnover bone disease is the result of the development of secondary hyperparathyroidism. It has been known for many years that hyperplasia of the parathyroid glands and high levels of PTH in blood occur early in the course of CKD (2,3). Numerous factors that lead to the overactivity of parathyroid glands in this clinical setting have been uncovered (Figure 1). These factors include the retention of phosphorus, decreases in the levels of calcitriol, intrinsic alterations within the parathyroid gland that give rise to increased PTH secretion as well as increased parathyroid growth, skeletal resistance to the actions of PTH, and hypocalcemia. Although each of the abnormalities is considered separately here, it is important to emphasize that these all are closely interrelated and one or more of these factors may predominate at different times throughout the course of kidney disease and likely will vary according to the particular type and the rapidity of progression of CKD. The factors involved in the pathogenesis of secondary hyperparathyroidism. The major role of phosphate retention in the pathogenesis of secondary hyperparathyroidism has been demonstrated by a series of studies over many years (4–7). The original proposal was that phosphate retention, as a result of reductions in GFR, would cause transient decreases in the levels of ionized calcium, which would, in turn, trigger an increase in PTH secretion and a new steady state would be achieved, with restoration of normal calcium and phosphate levels but with the consequence that high levels of PTH now would be required to maintain homeostasis. The “tradeoff” for the maintenance of normal concentrations of calcium and phosphorus was the development of hyperparathyroidism (8). Substantial support for the proposal was produced by several studies. It was clearly shown that a high phosphate diet results in parathyroid hyperplasia (9,10). More important, perhaps, was the demonstration that reductions of dietary phosphorus, in proportion to the degree of a reduction in GFR, was successful in preventing the development of hyperparathyroidism, and these observations were confirmed subsequently in clinical studies (11). Although it is beyond question that phosphate retention plays a role in the pathogenesis of hyperparathyroidism, the mechanism by which it mediates this effect is not well defined, and many potential mechanisms need to be considered. In normal humans, it has been shown that an oral phosphorus load results in an increase in serum phosphorus, a decline in the level of ionized calcium, and an increase in the levels of PTH in blood. However, there is doubt whether this occurs in early kidney failure, because hyperphosphatemia is not seen, even in patients whose PTH is already elevated (12,13). Similarly, hypocalcemia is not common in many patients with CKD, and there has been difficulty in demonstrating intermittent hypocalcemia after phosphate loading (12,14). Therefore, there is considerable doubt that this is the mechanism that accounts for the phosphate-induced effects on parathyroid function. In fact, experimental studies in which hypocalcemia was prevented by feeding a high-calcium diet, hypocalcemia did not occur and, in fact, increased slightly, even though hyperparathyroidism occurred (15). It is clear that hypocalcemia is not an essential factor for the development of hyperparathyroidism in the setting of CKD, and other factors must be involved. It has been demonstrated that the production of calcitriol is regulated by phosphorus, such that phosphorus retention could lead to a decrease in the levels of calcitriol in blood (16). It has been shown in the experimental setting that administration of calcitriol in amounts that are sufficient to prevent a fall in the levels of calcitriol in blood is successful in preventing the development of hyperparathyroidism (15). This mechanism also potentially could explain the effects of phosphate restriction in ameliorating hyperparathyroidism, because a low-phosphate diet might augment the production of calcitriol. Because studies in experimental animals have shown that phosphate seems to affect parathyroid function independent of calcium or calcitriol, it is likely that phosphate mediates these effects directly. This possibility was demonstrated by two groups of investigators, who independently demonstrated that changes in extracellular phosphorus concentrations in vitro resulted in an increased secretion of PTH in the absence of changes in ionized calcium (17–19). The mechanism by which phosphorus affects PTH secretion is not well understood at the present time. It has been shown, however, that the effects of high phosphorus concentrations to increase PTH secretion is a posttranscriptional effect, and these observations have led to studies of the effect of phosphorus on the stability of PTH mRNA (20). It has been demonstrated that the stability of PTH mRNA seems to be regulated by phosphorus, and this effect seems to be mediated by proteins (e.g., Au-rich RNA binding factor 1 [AUF1]) within the parathyroid gland that bind to the 3′ untranslated region of the PTH gene transcript (21–23). Additional investigations have demonstrated that high extracellular phosphate concentrations reduce the production of arachidonic acid by parathyroid tissue, an effect that is associated with an increase in PTH secretion (24). It is possible that this signaling mechanism may be the result of changes in cytosolic calcium on the phospholipase A2–arachidonic acid pathway. It is not known, however, how high phosphorus levels could affect the regulation of intracellular calcium in parathyroid cells. Phosphorus also seems to have major effects on parathyroid growth. In animals that are on a high-phosphorus diet, there is an acceleration of parathyroid growth, whereas a low-phosphorus diet prevents parathyroid hyperplasia (25,26). Studies in experimental animals have shown that this effect of dietary phosphorus on parathyroid growth occurs extremely rapidly, within days after the induction of kidney failure (27) (Figure 2). This observation may have important implications for therapy. The rapid effect of the induction of uremia on parathyroid gland growth and the influence of dietary phosphorus. Adapted from reference (27), with permission. The effect of a low-phosphorus diet to prevent parathyroid growth seems to be mediated by an increase in the cell-cycle regulator p21 (28). There seems to be a different pathway for phosphate-stimulated parathyroid growth, and studies have shown that TGF-α expression increases in the parathyroid gland, and similar increases of TGF-α by high-phosphorus diet in uremic animals have been demonstrated (28–30). Increased concentration of TGF-α in the parathyroid gland could interact with the EGF receptor and lead to activation of the mitogen-activated protein kinase and the induction of cyclin-1 to drive the cell into a proliferation cycle. The mechanism by which phosphorus mediates these effects is not understood at the present time, and although a type III phosphate transporter seems to exist in parathyroid glands, there is no evidence that this transporter mediates the effects of phosphorus on PTH secretion (31). Role of Decreased Synthesis of Calcitriol. Because the principal site for the production of calcitriol is the kidney, it is no surprise that decreases in kidney mass lead to a decrease in the ability of the kidneys to produce calcitriol. In the course of CKD, the decreased production of calcitriol contributes to the development of secondary hyperparathyroidism. Calcitriol levels seem to decline slowly and progressively throughout the course of CKD (14). These observations are somewhat surprising in that the increased levels of PTH would be expected to increase the activity of the 1-α-hydroxylase in the kidney in an effort to maintain these concentrations close to normal. That this does not occur is supported by studies that show a failure of the ability of PTH to increment calcitriol levels in patients with mild CKD (32). These observations indicate that other factors are involved in limiting the ability of the diseased kidney to increase calcitriol production. One such factor might be phosphate retention, because this can inhibit 1-α-hydroxylase (33). An additional factor may be fibroblast growth factor 23, which accumulates in renal failure and has been shown to decrease the production of calcitriol (34). Fibroblast growth factor 23 seems to be regulated by dietary phosphorus intake and the levels of serum phosphorus; therefore, this mechanism might play a role, at least in part, in the maintenance of phosphate homeostasis by regulating renal phosphorus excretion and also in mediating the effects of phosphorus on hyperparathyroidism (35). In recent years, an additional mechanism that likely plays an extremely important role has been uncovered (36). It is known that 25-hydroxyvitamin D, the principle storage form of vitamin D, circulates bound to vitamin D–binding protein. This protein can be filtered at the glomerulus and enters the proximal tubular cell by a receptor-mediated mechanism that involves megalin, which is required for the uptake of 25-hydroxy–bound vitamin D–binding protein into the cell and facilitates the delivery of the precursor, 25-hydroxyvitamin D, to the 1-α-hydroxylase (36). In the course of CKD, decreased GFR results in decreased delivery of substrate to the 1-hydroxylase, which will limit the ability of the kidney to produce the active sterol. In addition, in human CKD, many patients have significant proteinuria, which will lead to the loss of vitamin D–binding protein with its bound ligand in the urine and contribute to the high incidence of vitamin D deficiency, manifested by low levels of 25-hydroxyvitamin D, in this clinical setting (37). Substrate limitation could impair the ability of the diseased kidney to increase calcitriol production. As kidney disease advances, there are other factors that can limit the actions of calcitriol. This could occur because of decreases in the vitamin D receptor in target tissues (38–41) or from failure of the liganded vitamin D receptor to interact in a normal manner with its response element on DNA (42,43). Decreased vitamin D receptors have been demonstrated in the parathyroid glands of both humans and animals with kidney failure. In addition, it has been shown that ultrafiltrates of uremic plasma interfere with the interaction of the vitamin D receptor with DNA in vitro; therefore, there may be uremic toxins that can interfere with the normal actions of vitamin D.
Role of Intrinsic Alterations in the Parathyroid Gland. Hypocalcemia is a powerful stimulus for PTH secretion and for parathyroid growth. The effects of calcium seem to be mediated by the calcium-sensing receptor, and several studies have demonstrated that there is decreased expression of the calcium-sensing receptor in the hyperplastic glands that are seen in kidney failure (44,45). The decrease in calcium-sensing receptors potentially could lead to increased PTH secretion because the response of the parathyroid glands to stimulation by calcium may be diminished. However, the relationship between the expression of the calcium-sensing receptor and the baseline levels of PTH is not clear. In a murine model of renal transplantation, PTH levels return to normal within a short time after transplantation, even though reduced calcium-sensing receptors still are present in the parathyroid gland (46). Studies in vitro also have dissociated the normalization of PTH levels from calcium-sensing receptor expression (47). Conversely, evidence also exists that the calcium-sensing receptor may play a role in parathyroid growth in that studies with calcimimetic agents in experimental animals have shown that activation of the calcium-sensing receptor by these means is associated with the prevention of parathyroid hyperplasia (48–50). Decreased levels of calcitriol also may contribute to parathyroid abnormalities. Calcitriol is major regulator of PTH secretion, and the vitamin D receptor is expressed in the parathyroid glands. Calcitriol decreases PTH secretion in vivo and in vitro as a result of an effect at the level of transcription of the PTH gene (51,52). Calcitriol also may alter PTH secretion by other mechanisms. In addition to the indirect effects of increasing serum calcium by increasing intestinal calcium absorption, the direct effects of calcitriol may include increases in parathyroid vitamin D receptor, regulation of parathyroid growth, alteration in the expression of the calcium-sensing receptor, and possibly an effect on the set point for calcium-regulated PTH secretion. It has been demonstrated that vitamin D receptor expression is decreased in hyperplastic parathyroid glands that are seen in kidney disease (39,41), and it has been shown experimentally that administration of calcitriol is associated with upregulation of the vitamin D receptor and the calcium-sensing receptor in the parathyroid gland (53,54). An effect of calcitriol on parathyroid growth also has been demonstrated (55). This effect seems to involve the induction of the cyclin-dependent kinase inhibitor p21 (56). The role of calcitriol in parathyroid growth has been confirmed in vitamin D receptor knockout mice in which normalization of serum calcium corrects PTH levels but does not correct parathyroid hyperplasia (57). The consequences of parathyroid growth also are important in the disordered parathyroid function of secondary hyperparathyroidism in kidney failure. It has been known for a long time that some parathyroid glands that have been resected at parathyroidectomy demonstrate numerous nodules and that staining for the vitamin D and calcium-sensing receptors is decreased markedly in these nodules (44,45). Some of these nodules may represent monoclonal expansions of parathyroid cells (58). An important question is whether the decreased expression of the calcium-sensing receptor and vitamin D receptor leads to the accelerated parathyroid growth or the accelerated growth somehow is associated with a reduction in the expression of these receptors. Studies by Ritter et al. (59) have demonstrated that parathyroid cell proliferation seems to precede the loss of the calcium-sensing receptor in parathyroid glands from animals with kidney failure. 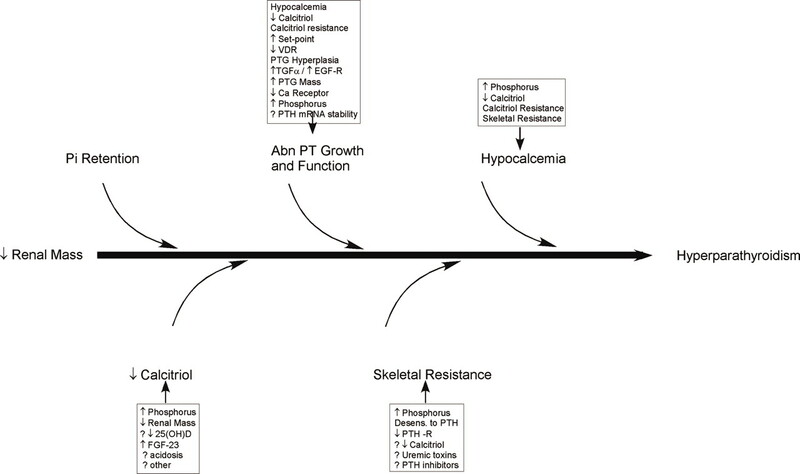 Skeletal Resistance to the Actions of PTH. 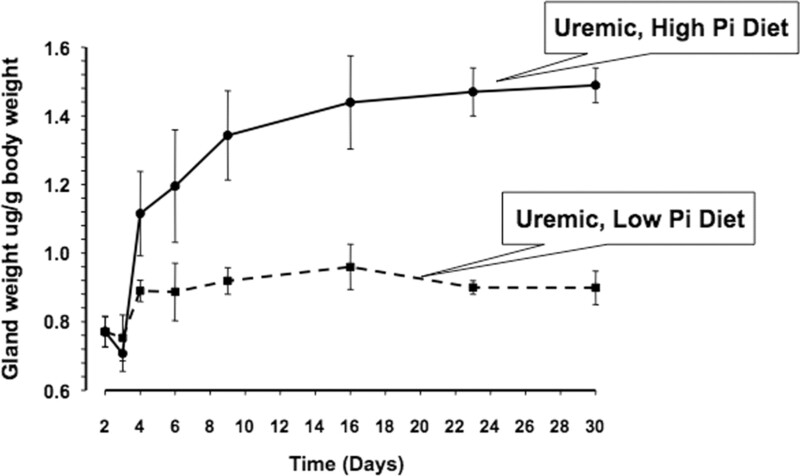 A reduced calcemic response to the administration of PTH has been known for many years, and it also has been recognized that there is delayed recovery from induced hypocalcemia in patients with kidney disease (60,61). This phenomenon, known as skeletal resistance to the calcemic actions of PTH, may contribute to the development of hyperparathyroidism. Many factors likely are involved in this skeletal resistance, including phosphorus retention (62), possibly decreased levels of calcitriol (63–65), downregulation of the PTH receptor (66,67), and the potential actions of PTH fragments that have been shown to blunt the calcemic effect of PTH (68). Experimental support has been obtained for all of these factors. Low-turnover bone disease commonly is observed in patients with kidney disease, especially in patients who are on dialysis, and is characterized by an extremely slow rate of bone formation. Some cases demonstrate osteomalacia, which is characterized by defective bone mineralization in addition to the very slow bone formation rate. The osteomalacic lesion is due mostly to aluminum accumulation and is less common nowadays with decreased use of aluminum-based phosphorus binders (69). The adynamic bone of kidney disease is being found with increasing frequency (70) and has been described in some cases even before dialysis (71,72). The pathogenesis of adynamic bone is not well defined, but it seems that a number of factors might be involved (Figure 3) (73). The factors involved in the pathogenesis of adynamic bone in chronic kidney disease (CKD). Adapted from reference (73), with permission. A number of these factors contribute to a relative state of hypoparathyroidism such as the administration of high calcium loads from calcium-containing phosphate binders or the use of high-dialysate calcium concentrations, as well as the use of potent vitamin D sterols. Age also may be a factor because many elderly patients may have low bone turnover on the basis of postmenopausal osteoporosis or osteopenia in association with systemic disease. Several other complications of the uremic state can lead directly lead to decreases in bone formation and include increases in the circulating concentrations of peptides that may decrease bone formation, such as osteoprotegerin and N-terminally truncated PTH fragments, undefined uremic toxins, acidosis, decreased expression of PTH receptors, alterations in concentrations of growth factors and cytokines that affect bone turnover, previous corticosteroid therapy–induced osteoporosis, or general malnutrition. One interesting growth factor is bone morphogenic protein-7, which initially was shown to have a beneficial effect in osteitis fibrosa (74) but was suggested recently to have a beneficial effect in adynamic bone (75). Low-turnover osteomalacia in the setting of CKD has been recognized for many years. It now is clear that most cases of osteomalacia are associated with aluminum accumulation in bone, and its incidence has decreased markedly with the decreased use of aluminum-containing phosphorus binders. Metabolic bone disease in patients with kidney disease often is asymptomatic, and symptoms appear only late in its course. Many of the symptoms are nonspecific and include pain and stiffness in joints, spontaneous tendon rupture, predisposition to fracture, and proximal muscle weakness. A similar set of symptoms may be seen in both the low- and high-turnover type of skeletal abnormality. It is important to emphasize that the absence of clinical signs and symptoms of metabolic bone disease do not underscore the importance of these abnormalities, because many of the processes that contribute to the underlying metabolic bone disease also have consequences at extraskeletal sites, and the control of these processes is important to decrease morbidity and mortality. Extraskeletal calcifications, particularly involving the vasculature, and calcification of the skin and calciphylaxis also may be seen. Cardiovascular calcification is extremely common and important in patients with kidney disease, in whom it develops and progresses rapidly and predicts a variety of adverse outcomes. The various types of metabolic bone disease and associated mineral disorders may contribute to this. The processes that are responsible for vascular calcification are the focus of recent research (76,77). The evidence now suggests that vascular calcification is an active, regulated process that has many similarities to the process of skeletal mineralization. Studies suggest that the normal vessel wall expresses proteins that inhibit calcification such as matrix Gla protein. In addition, circulating proteins such as fetuin-A are produced at remote sites and act to inhibit soft tissue calcification systemically. However, alterations of these proteins may lead to a seeming transformation of vascular smooth muscle cells into osteo/chondrocytic-like cells that then facilitate calcification. Both clinical and basic research findings indicate an inverse relationship between bone mineralization and vascular calcification. The mechanisms that link these two processes are a topic of active investigation. A detailed discussion of extraskeletal calcification is beyond the scope of this review. Although histologic examination of un-decalcified sections of bone remains the gold standard for the precise diagnosis of renal bone disease, bone biopsy is not widely used in clinical practice because of the invasive nature of the technique. Accordingly, a biochemical assessment of disorders of bone and mineral metabolism is the mainstay of the diagnosis and treatment. In addition to the measurements of calcium and phosphorus concentrations, which in their own right can contribute to hyperparathyroidism, it is essential to obtain a direct index of parathyroid activity by measurements of PTH. Measurements of calcium and phosphorus need to be obtained frequently, and therapy needs to be adjusted according to widely accepted clinical practice guidelines to maintain the calcium and phosphorus concentrations within defined ranges (78). Accurate assessment of PTH assays remains problematic, even though the assays for PTH have undergone substantial evolution in the past few decades (79). The early confusion over the interpretation of PTH assays after their initial introduction gave way to a more stable period with the introduction of two site immunometric assays, which were believed to measure intact PTH. It is on the basis of these first-generation immunometric assays that current therapeutic guidelines were provided. Further research in recent years, however, has complicated the interpretation of these results in that it is now known that these assays also measure, to varying degrees, N-terminally truncated PTH fragments in addition to intact PTH (80,81). It now seems that some biologic activities can be attributed to these N-terminally truncated PTH fragments, such as PTH 7-84, that seem to be opposite in direction to the actions of PTH on bone (68,82,83). This continues to be an active area of research. Further developments in PTH assay technique have introduced assays that now are more specific for the intact PTH (1-84) molecule (84). These assays have been instrumental in uncovering the potential biologic actions of the N-terminally truncated PTH fragments, such as PTH (7-84). Much needs to be learned about the biology and the effects of such PTH fragments before clinical applications and clinical decision making using these measurements or ratios between PTH 1-84 and PTH fragments such as 7-84 can be defined. These second-generation, more specific assays for PTH (1-84) are not widely available, and, accordingly, there is much more reliance on “intact PTH” assays of the first-generation type, which seem to perform well in clinical practice. However, although individual assays perform well, there is considerable variation in the results that are obtained with assays from different manufacturers, mainly because of the extent of cross-reactivity with the circulating N-terminally truncated PTH fragments (79,85). This issue complicates practice guidelines such that it seems inappropriate to require rigid adherence to the recommended PTH targets, because the various assays in use may give quantitatively different results. Efforts are under way, spearheaded by the National Kidney Foundation, to try to provide biologic standards that clinicians and investigators may use to help in the interpretation of PTH results. A number of biologic markers of bone formation and bone resorption might be used in conjunction with measurement of the mineral ions and PTH to gauge hone cell activity. Of these, it seems that alkaline phosphatase and bone-specific alkaline phosphatase are most useful in this regard, and other proteins, such as osteocalcin, procollagen, propeptides, collagen breakdown products, tartrate-resistant acid phosphatase, and collagen C-terminal telopeptide, do not add clinical value, and much further work needs to be done to try to obtain useful biochemical assessments of bone cell activity. The objectives for the management of metabolic bone disease in patients with CKD are to maintain the blood levels of calcium and phosphorus as close to normal as possible and to undertake measures to prevent the development or to begin the treatment of established hyperparathyroidism and to prevent the development of parathyroid hyperplasia. An additional goal is to prevent extraskeletal calcifications and to avoid oversuppression of bone turnover to the extent that adynamic bone might be induced. It also is necessary to avoid the accumulation of substances that may be toxic to bone, such as aluminum. Central to the prevention and management of metabolic bone disease in this clinical setting is the ability to intervene early in the course of CKD, when this process begins, using a “stepped care” approach as illustrated in Figure 4. Disturbances in the regulation of calcium and phosphate homeostasis need to be evaluated by measurements of PTH when GFR is reduced. If PTH is elevated, then vitamin D status should be evaluated and treated if necessary. Recent data have raised another consideration in that kidney disease now is established to be a significant risk factor for vitamin D deficiency, and levels of 25-hydroxy vitamin D, the principal storage form of vitamin D and the best index of vitamin D nutrition, are found to be extremely low in a large majority of patients with CKD (37). Current recommendations are to correct this deficiency by administration of a vitamin D preparation such as ergocalciferol in sufficient dosage to raise 25-hydroxyvitamin D levels above 30 ng/ml. The clinical efficacy of this remains to be demonstrated with regard to the prevention of hyperparathyroidism. Dietary restriction of phosphorus may be used in early CKD to control the developing hyperparathyroidism, although protein restriction should be modest to avoid malnutrition. Other measures that have been shown to be successful include calcium supplementation, the use of phosphate binders and the use of vitamin D sterols such as calcitriol (86), the vitamin D prohormones alfacalcidol (87) and doxercalciferol (88), and the vitamin D analog paricalcitol (89). Practice guidelines also suggest that limitations of the amount of calcium-based phosphate binders also be considered (78), because some data suggest that large calcium loads may contribute to the progression of vascular calcifications in patients who have ESRD and are on hemodialysis. The introduction of non–calcium-containing phosphate binders can facilitate limiting calcium intake, and sevelamer hydrochloride has been extremely useful in patients who are on dialysis to help control serum phosphorus while simultaneously limiting calcium intake to the recommended values (90). Sevelamer has been shown to be associated with decreased progression of vascular calcifications (91). The recently introduced lanthanum carbonate also has been shown to be an effective phosphate binder that also can facilitate phosphorus control while limiting calcium intake (90). A “stepped-care” approach to the prevention and treatment of secondary hyperparathyroidism in CKD. In advanced kidney disease, the use of active vitamin D sterols can be useful in the control of hyperparathyroidism, and several preparations now are available in this regard. The native hormone calcitriol is available orally and intravenously and is effective but has a reasonably narrow therapeutic window between efficacy and toxicity. Other vitamin D sterols have been introduced, such as the vitamin D prohormones 1-α-hydroxyvitamin D3 and 1-α-hydroxyvitamin D2. Both of these sterols undergo 25-hydroxylation in the liver and become 1-25-dihydroxyvitamin D3 and 1-25-dihydroxy vitamin D2, respectively. Whereas in the therapeutic ranges, there is little difference between the ability of these vitamin D2 and vitamin D3 prohormones to raise calcium or phosphorus, there seems to be lesser toxicity associated with the vitamin D2 sterol when administered at high dosages, an effect that likely is due to alternative metabolic pathways (92,93). An additional approach has been the introduction of vitamin D analogs, in which structural alterations in the vitamin D molecule have been introduced, to try to achieve some selectivity for suppression of PTH while minimizing the effects on calcium and phosphorus. Three such analogs have been introduced: 19-nor-1,25-dihydroxyvitamin D2 (94), 22-oxacalcitriol (95), and 26,27-hexafluorocalcitriol (96). 19-Nor-1,25-dihydroxyvitamin D2 is widely used in the United States and has been effective with somewhat lesser toxicity than the native sterol calcitriol (97). This was used initially in intravenous form in patients who were on hemodialysis but now is available in oral form and is being used in CKD stages 3 and 4, where it seems to be extremely effective with little toxicity (89). Although in experimental animals there are significant differences in the properties of various vitamin D analogs in terms of effects on calcium and phosphorus absorption as well as on vascular calcification (98–100), there are no comparative studies of the vitamin D analogs with regard to safety and efficacy in patients. In recent years, there has been the intriguing observation that seems to suggest that administration of vitamin D sterols to patients who are on hemodialysis may be associated with a survival benefit compared with that of patients who do not receive any vitamin D sterol (101). The mechanism of such an effect is not known but raises the consideration that nonclassical effects of vitamin D may be playing a role. Similarly, a retrospective study of outcomes of patients who were treated with calcitriol compared with those who received paricalcitol demonstrated that there seemed to be a survival benefit to receiving the vitamin D analog paricalcitol (102). Again, the mechanism of such an effect is not known and clearly requires further detailed study. The calcimimetic cinacalcet provides another therapeutic agent for the control of hyperparathyroidism in patients with ESRD and has been shown to be effective in reducing the levels of PTH (103,104). This agent, which is an allosteric activator of the calcium-sensing receptor, results in a lowering of serum calcium and can facilitate keeping the concentration of serum calcium within the recommended targets. Cinacalcet therapy also results in a small decrease in phosphorus concentrations in patients with ESRD that also is favorable to meeting the practice guidelines. This approach is especially useful for patients who have serum calcium and phosphorus at or slightly above the upper limits of normal and in whom the use of vitamin D sterols might be problematic. Calcimimetic therapy can be used in combination with any and all of the approaches discussed. As a result of detailed investigations in the past 4 decades, there have been considerable advances in the understanding of the pathophysiology of the many patterns of metabolic bone disease that occur in CKD. These observations have led to a rational approach to therapy and to the discovery and introduction of new therapeutic agents that may be used to modify this complication of kidney disease. These approaches also have continued to lead to the uncovering of new areas of interest that continue to require investigation, such as the efforts to understand and to modify vascular calcification, to understand the biologic significance of N-terminally truncated PTH fragments, and to understand the biologic significance of the nonclassical effects of the vitamin D system. It is hoped that, as a result of these advances, the outcomes of the patients with CKD can be improved.